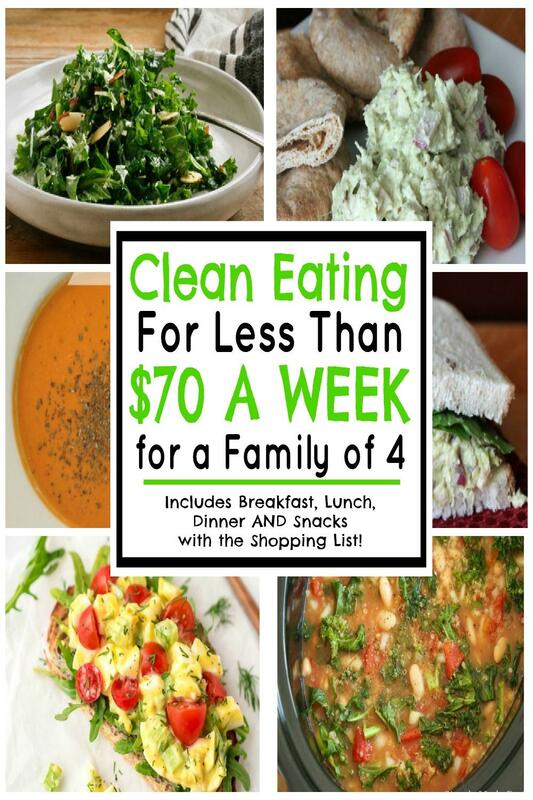 If you are tired of eating processed food because you are trying to save money, I’m here to share how you can obtain clean eating for less than $70 a week for a family of 4 (without using coupons)! You are going to want to PIN or bookmark this page for later! 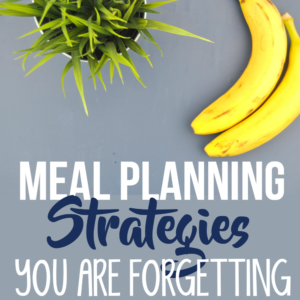 It’s an excellent meal planning resource that will help you manage your grocery budget and plan smart, healthy meals for your family. You may be wondering, what is “clean eating?” For our family, clean eating means eating items with natural ingredients, food that has not been processed, is (mostly) organic and good for you. Clean eating also means removing or reducing other additives (sugar, salt, and unhealthy fats) in your diet. You will notice that these meals do not have a lot of carbs and are vegetarian or contain lean meats. I’m sharing a typical weekly family meal in our home – including breakfast, lunch, dinner, and snacks to create an entire week’s worth of food for 4 people for less than $70! 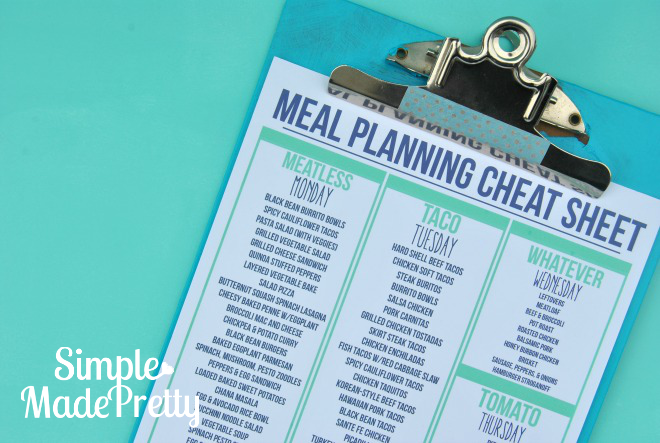 By the way, if you need help with meal planning, I’ve got your covered! 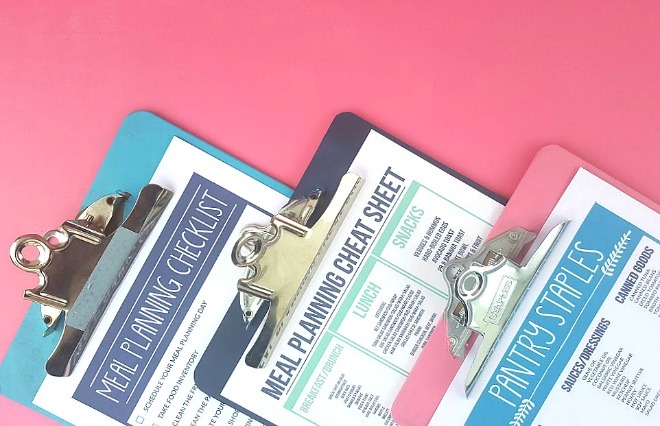 Go here to check out my post with the ultimate meal planning strategy plus free printable forms and dinner ideas cheat sheet! That said, the meals I’m sharing are very basic, easy-to-make meals that you probably have had before but are healthier versions. I’m also including a full shopping list with prices broken down so you can try this healthy meal plan yourself! 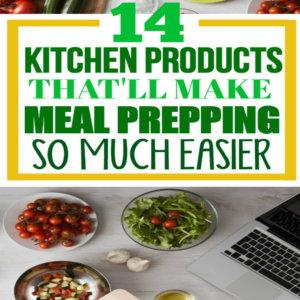 Another great thing about all of these meals is that they can be prepared in advance. All breakfast meals are grab-and-go and the lunches can be made ahead and packed for those mornings you need to be out the door fast. Be sure to read our post 4 Simple Healthy School Lunches for more ideas. Make the most of this meal by prepping everything on the first day of the week. My favorite lunch packing items to use are Easy Lunchboxes and these Mini Dippers. You may find that this menu consists of repeated meals. That’s because people, in general, tend to eat the same things and it keeps costs down! If your kids are not picky eaters then they will enjoy these meals. Our kids do not eat all of these exact meals listed below – we modify some of the meals in order to appeal to their taste buds – please keep that in mind when reviewing the shopping list below. Your family’s needs may vary depending on everyone’s likes/dislikes 🙂 Keep reading to the end for modified meals (with recipes) that we make our kids while still using the major ingredients from our shopping list. I eat eggs and Greek yogurt daily to add protein to my diet. My hubby doesn’t like to eat yogurt or eggs daily so he gets his protein with a simple protein shake. I’m not a nutritionist or clean eating expert. You should check with a health expert/physician to see if this meal plan is the appropriate calorie intake for you. This meal plan is based on a 1400-1750 calorie diet. Each of my recipes listed below is for 1 serving unless otherwise noted. Links to other recipes include the serving size on their page. Shopping list prices are from Aldi, local to my area (Washington D.C. area) and the current season (Summer). Pricing will vary where you live and the current season you are shopping. This meal plan is meant to give you an idea of what easy, healthy meals on a budget can look like. Grocery prices in your area may be less or more and the cost will vary depending on the season. I personally dislike grapefruit but adding the banana and orange makes this smoothie delicious and grapefruit is known to be great for weight-loss. Grab and go tip: Place everything (minus the water) into sandwich bags and place in the freezer until you are ready to make in the morning. To add protein, add half a container of soft tofu or protein powder. Blend everything in a blender and serve. Makes 1 serving. We use a Ninja Mega Blender system that includes Nutri Ninja single cups so we can easily make single-serving smoothies in the Ninja cup and head out the door. Did you ever eat egg salad as a kid? 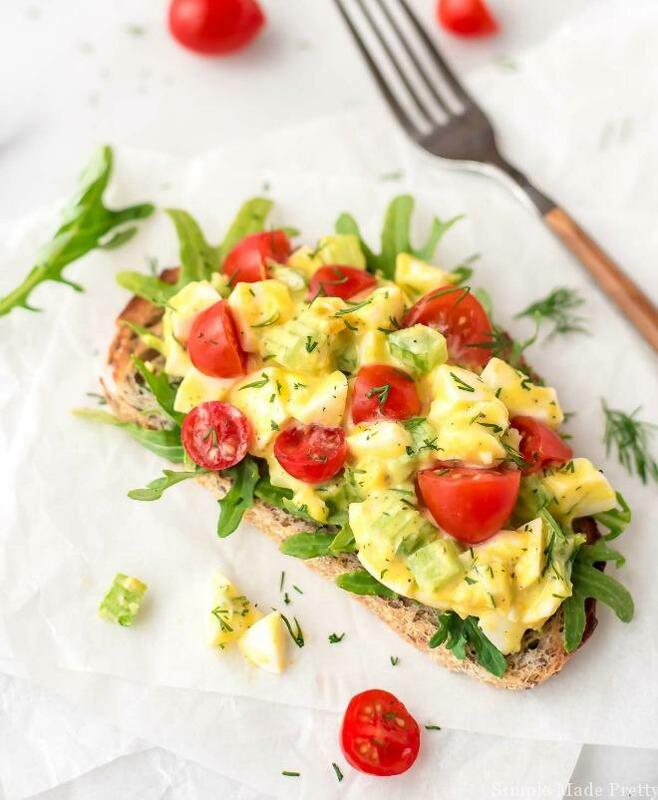 I did and loved it 🙂 Egg salad is simple to make and this healthy version is super easy as well! **I use 1 slice of sprouted 7-grain bread to make open-faced sandwiches. This tomato basil soup is one of our favorite meals in our house and the kale salad is simple but packed with nutrition. FYI, kale is high on the list of the world’s healthiest foods! We grow kale in our garden during the warmer months so making this salad is pretty much free! Find the tomato basil soup recipe HERE. Find the lemon-garlic kale salad recipe HERE. 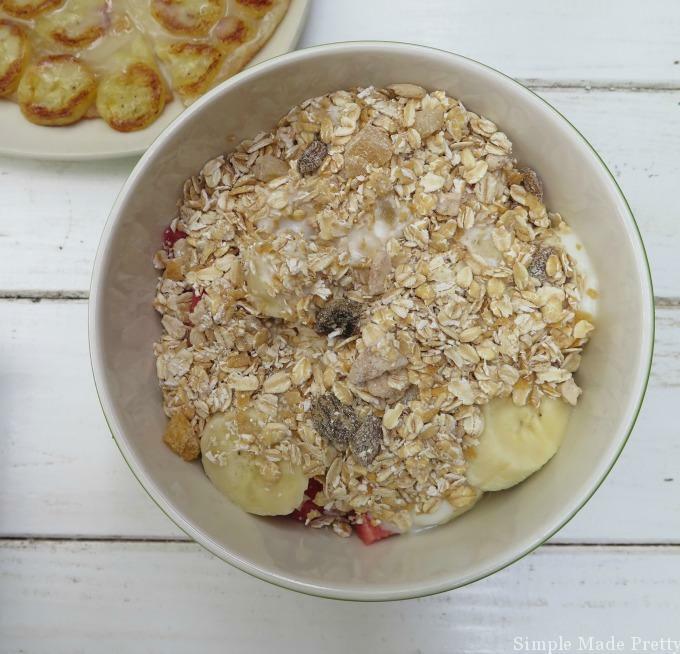 I love overnight oats because oatmeal is very healthy and overnight oats are one of the simplest morning meals to make! Place oats and almond milk in a small mason jar in the frig overnight. If you like your oatmeal warm, heat the container in the morning then add the PB and strawberries and mix. If you don’ mind cold oats, just mix everything the night before. Makes 1 serving. This Cobb salad is healthier because we eliminate the bacon and cheese and make our own dressing. 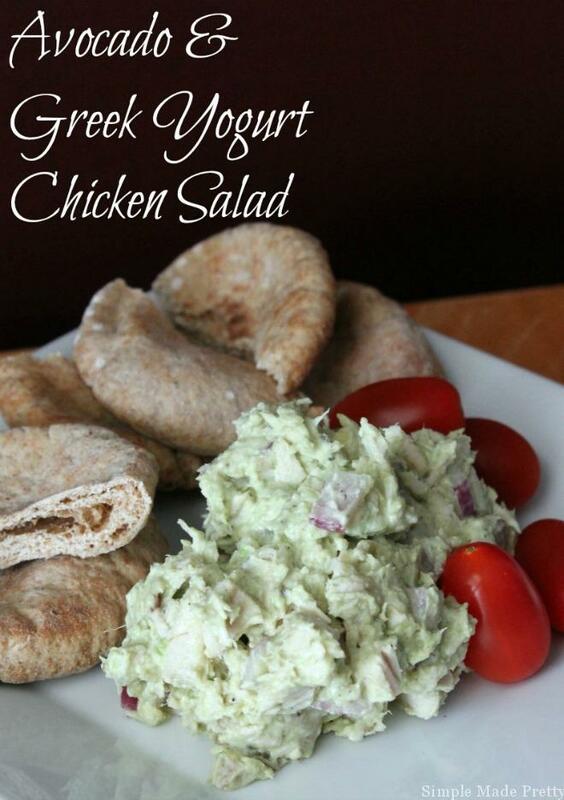 Pack this for lunch with the dressing in a mini dipper container on the side. Combine everything in a bowl, toss with dressing. Makes 1 serving. Whisk everything together in a bowl and pour into a storage container. We keep our dressing for up to a week in the frig. Heat the zoodles in extra virgin olive oil and garlic on medium heat until zoodles are almost soft. Add mushrooms and spinach and saute. Mix in pesto and serve. Makes 1 serving. Blend everything in a blender and serve. 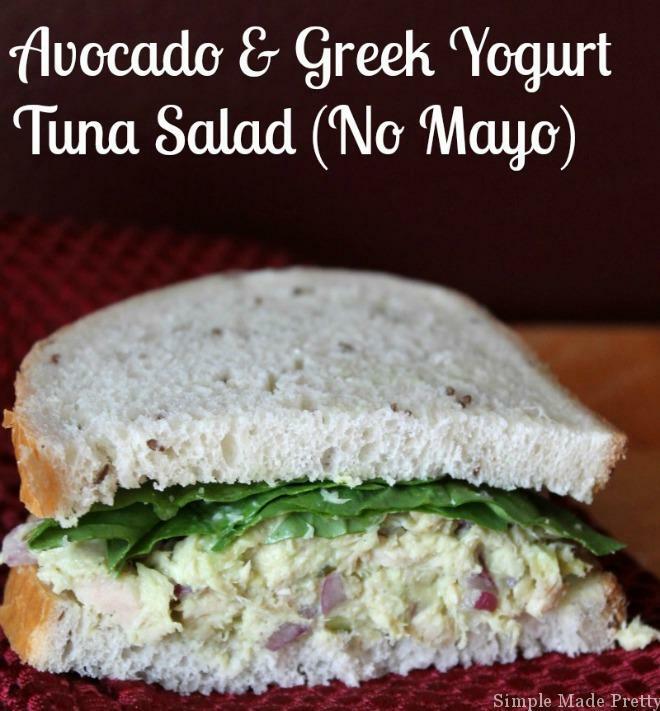 You will want to make tuna sandwiches using Greek yogurt going forward after trying this healthy version! **I use 1 slice of sprouted 7-grain bread and chunk light tuna, packed in water to make open-face sandwiches. We serve these to the kids with whole wheat tortillas but the romaine leafs make a healthier meal if your kids like lettuce. The chicken is freezer friendly so save leftovers or double the recipe for a later meal. This recipe serves 4. Cook the chicken, water and taco seasoning as directed on the taco seasoning package. Top each lettuce leaf with chicken mixture, tomato and cilantro. Makes 4 servings. Combine everything in a bowl, toss with balsamic dressing (recipe above). Makes 1 serving. I LOVE this soup! 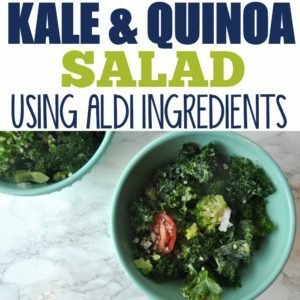 I made this recently using kale and tomatoes grown in our garden and it was soooo good! 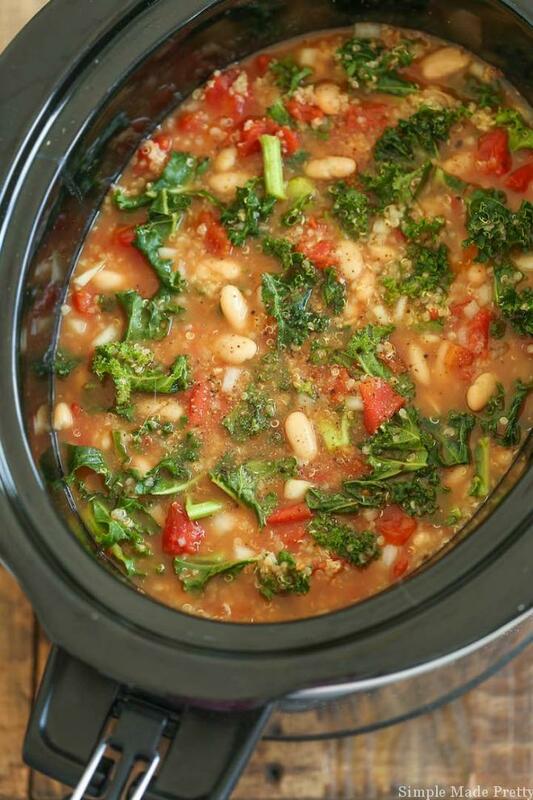 It is one of my favorite meatless meals to make in the slow cooker. 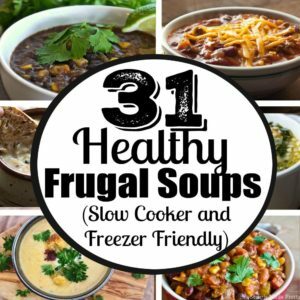 This meal is freezer friendly if you have leftovers, freeze and save for a later meal! **I use 1 slice of sprouted 7-grain bread to make open-faced sandwiches. The first time I had this dish was at the Protein Bar and I fell in love. I knew I had to recreate it and once I did, our kids fell in love with it too! This meal is freezer friendly – if you have leftovers or like to prepare freezer meals in advance 🙂 This recipe serves 4. Cook the quinoa as directed. Lightly saute spinach in extra virgin olive oil in a separate pan while quinoa is cooking. Mix spinach, chicken, and pesto with the cooked quinoa. Makes 4 servings. Our kids eat this instead of the Orange Grapefruit smoothie. You can sneak in milled flax seed or half a container of soft tofu and they will never know! Blend everything in a blender and serve. Makes 1 serving. Another option is to substitute the cinnamon for 1 tbsp of cocoa powder for a Banana Chocolate Oat smoothie! Spread the PB on both sides of the bread, arrange strawberry slices on top. Eating a clean, healthy diet doesn’t have to be expensive or difficult if you stick to simple, natural ingredients. Try turning one of your favorite recipes into a healthier meal by substituting a low-calorie item (romaine lettuce instead of a tortilla, Greek yogurt instead of mayo, etc). Looks great, sadly here in Nova Scotia Canada that meal plan is going to run me at least double (which is well out of our budget – $50 a week!). I am very jealous of where ever it is that you live to be able to buy such great foods for such cheap prices! Hi Kristen, Sorry to hear that! We live in the Washington DC area – believe it or not, grocery prices and the cost of living are high here but we save on groceries by shopping at Aldi. The grocery list for a family of four looks like a grocery list to feed one person for a week to me! For example: Let’s look a breakfast, this is breakfast smoothie is for ONE person: 1 banana, 1/2 a grapefruit, 1/2 an orange blended to make one breakfast smoothie. What about the other 3 people? What are they eating? If all 4 people are having the same smoothie…it would be four times the ingredients, correct? You would need 4 bananas, 2 grapefruit, 2 oranges per DAY for four people and you only have 3 grapefruit on your grocery list and 9 bananas. What am I missing here? What do you eat on the weekend? Five days is technically not a full week. Hi Melanie! My sister and I are going to try this tomorrow! She’s coming over to meal prep everything! I just have a quick question; under the “snacks”, you have several things listed. Are we to eat all things listed for each day, or just choose of the the things listed? Thanks for stopping by! I will def check out some of your meals! For the snacks, I eat one of the items listed in the morning and one in the afternoon. Yes, other parts of the world, prices are different. I’ve found eggs as low as 59 cents a dozen before where we live in DC. I hope my suggestions help out! This is great! I am so inspired. We made the tomato soup and it was DELICIOUS! I was not a huge fan of tomato soup but this is something I will continue to make. Just about how many servings does it make? I must have missed that part. Hi Sarah, The recipe should yield 4 servings depending on how much your family eats, we usually have leftovers. This post is amazing and so timely as Aldi has just come to Virginia Beach,Va. and it is such a pleasure to shop there. I am inspired by you and plan to shop your list tomorrow, I assume if I half everything on the list, it would feed my husband and me. Is that correct. Thank you so much for your speedy reply! I can’t believe how much I’m enjoying your blog,and I never thought I would ever say, “I love grocery shopping”, but Aldis is amazing. I have 5 grocery stores all within a mile of my house and I absolutely dread the shopping at each one. My husband and I will be starting our 5 days of clean eating the day after tomorrow, thanks again neighbor for this wonderful article and for the nudge We needed to begin a healthier lifestyle. Hi Ellen, Yes! That’s not the first time I’ve heard “I love grocery shopping now” from friends after shopping at Aldi 🙂 Enjoy the meal plan! My wife and I spend more than this on just the two of us! We apparently have some work to do. I’ve always used the “excuse” that our clean/paleo/organic diet is expensive, and it is, but it seems we could still be spending quite a bit less. Thanks for sharing! I’m only on Tuesday and I see flaws with this plan. I am no stranger to clean eating, but doing it on a small budget I very challenging. I have a family of 5, but baby is just now starting solids so he isn’t included in the meal plan. I breastfeed. Even adding extra eggs, almonds, or yogurt I am still always hungry on this. As for leftovers, there are none. This plan seems to have been made for people who can eat like birds and still be satisfied. There is also the fact that some items were not included on the shopping list, such as lemons/lemon juice. I also ended up over budget. I hope this works for others. It doesn’t work for us. Thanks for pointing out the lemon juice. I’ve added it to the existing pantry items. Thanks a lot for sharing this plan. Some really useful ideas to pick up! I really like the simple approach you have to diet plans. And the meals look healthy and delicious, too. Looks good, but in Texas those prices are double . Thank you, John. As mentioned in this post, it depends on the time of the year and where you live that prices may differ.